The year 2010 has become, somewhat unexpectedly, the Year of Mark Twain. And so, for this holiday season, we present a Christmas story that only he could write, about the wicked boy who got everything. When Twain arrived in San Francisco in 1864, he quickly landed a job writing for a newly launched literary weekly called The Californian, which was co-edited by Bret Harte (future author of “The Outcast of Poker Flat”) and Charles Henry Webb. 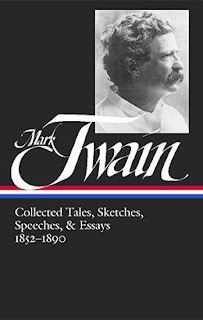 With their encouragement and guidance, he honed his skills as a satirist and within a few months he was paid $50 a month to write one piece per issue—a respectable amount at the time, although never enough for the young Samuel Clemens, whose financial woes were a recurrent theme in his journals and letters. The newspaper was a success, but turnover among owners and editors led to its eventual demise. Before the periodical ceased publication in 1868, it had also introduced Ambrose Bierce to its readers. Published two days before Christmas in the newspaper’s first year, “The Christmas Fireside” features a character familiar to readers of Mark Twain: the naughty boy. Compared with the affably mischievous Tom Sawyer and Huckleberry Finn, however, “Jim” is a downright monster. But Twain’s satire isn’t really about boyhood. If anything, Twain has written what might be called an “anti-story”—less about what does happen to Jim and more about what does not. He has two targets: the laughably implausible Sunday school catechisms of the era and (particularly in the closing paragraphs) the American propensity for rewarding corruption and vice among members of its political and entrepreneurial class. “Bah, humbug!” one might think, but what keeps the young Mark Twain from being the Californian Scrooge is a sense of impishness to mitigate the cynicism. Once there was a bad little boy, whose name was Jim—though, if you will notice, you will find that bad little boys are nearly always called James in your Sunday-school books. It was very strange, but still it was true, that this one was called Jim. . . . If you don't see the full story below, click here (PDF) or click here (Google Docs) to read it—free! Hilarious! What a gem. I wonder how many people were offended by this story? To be sure it was not read as a quaint fireside story to their children. Enjoyed the story - I remember seeing a series of Mark Twain's adventures when still at school. This story explains a lot about parrots I didn't know before. This story really leaves me wondering what must have been the political climate when Mark Twain wrote this story? Was Mark Twain part of a group of emerging satirists, critical of society? Or were his ideas against the popular trend of the time? What can we say about our society now? How has it changed / not changed? Ain't it so in real life! Twain, but rather a short short story to wait for all week. Mark Twain~the man who should have been my husband, but born at a different time. I wonder if he had a particular member of the Legislature in mind when he wrote this story...it would be interesting to know.